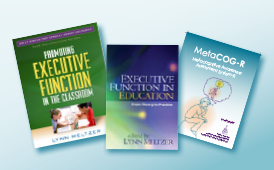 Meltzer, L.J., Greschler, M., Kurkul, K., & Stacey, W. Executive Function and Peer Mentoring: Fostering Metacognitive Awareness, Effort, and Academic Success. In Harris, K., & Meltzer, L. (Eds.) The Power of Peers in the Classroom: Enhancing Learning and Social Skills. New York: Guilford Press, 2015. Meltzer, L.J. (2014). Teaching executive function processes: Promoting metacognition, strategy use, and effort. In Naglieri, J. & Goldstein, S. (Eds.) Executive Functioning Handbook. New York: Springer, 445- 474. Meltzer, L.J. (2013). Executive function processes: The foundation of academic and life success. International Journal for Research in Learning Disabilities, 2013, 1(2), 31-63. Harris, K., & Meltzer, L. (Eds.) (2015) The Power of Peers in the Classroom: Enhancing Learning and Social Skills. New York: Guilford Press. Meltzer, L.J. (2010) (Ed.) Promoting Executive Function in the Classroom. New York: Guilford Press. Meltzer, L.J. (Ed). (2007) (Ed.) Executive Function in Education: From theory to practice. New York: Guilford Press. Stein, J., Meltzer, L.J., Krishnan, K., Pollica, L., & Roditi, B. (2006). Making Homework work at Home: Strategies for Homework Success. N.Y: Scholastic. Meltzer,L.J., Roditi, B., Steinberg, J., Biddle, K., Taber, S., Caron, K., Kniffin, L., & Sales, L. (2005). Meltzer,L.J., Roditi, B., Haynes. D., Biddle, K., Paster, M., & Taber, S. (1996). Strategies for Success: Classroom Teaching Techniques for Students with Learning Problems. Austin, Texas: Pro-Ed. Meltzer, L.J. (1993). (Ed.). Strategy Assessment and Instruction for Students with Learning Disabilities: From Theory to Practice. Texas; Pro-Ed. Meltzer, L.J., Solomon, B. (1988). Educational Prescriptions for the Classroom: Strategies for Students with Learning Problems. Educator’s Publishing Service, Cambridge, MA.